There are so many exciting events coming up! One of the events is new for our community, Literacy Night on 6/12. This event is an opportunity for each student to showcase some of their literacy work/progress in their classrooms and for students and families to explore resources for maintaining literacy progress over the summer. The other exciting aspect of this event is that all classrooms will be showcasing student art similarly to how we have done at our previous PTSA Art Walks. 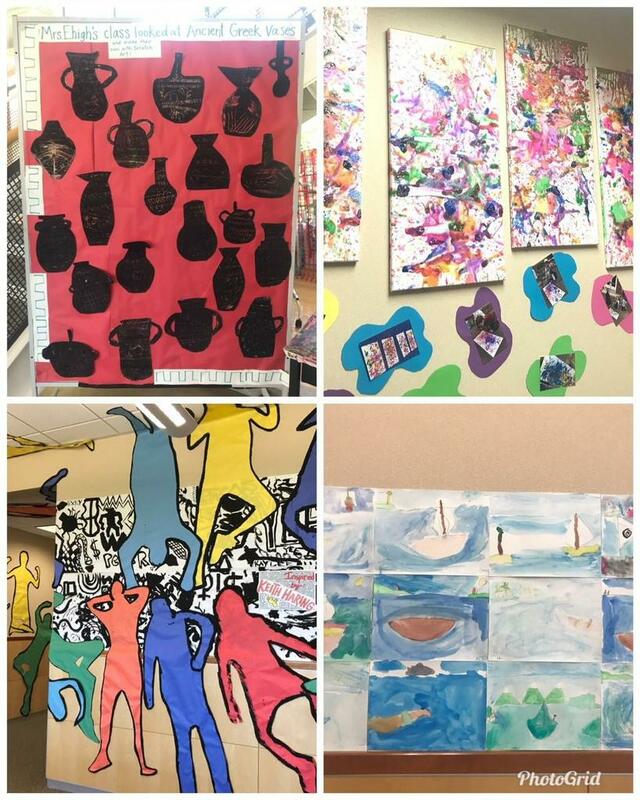 The art will be on display outside each classroom for your viewing pleasure! A small sample of what you can expect is below! A HUGE thank you to Vanessa Lamoreaux and Tiffany Knauer, our PTSA Art Docent Chairs, for all of their hard work in coordinating the PTSA Art Docent program and preparing classrooms for this culminating Art Walk. Additionally, we have our annual Field Day, Family BBQ & Egg Drop! Sixth graders will have a Promotion Ceremony and a Pool Party after school. It’s a busy and exciting time, please check the calendar often and feel free to call for details!